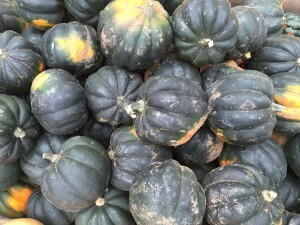 There are so many varieties of winter squash, it seems futile to try to list them all here. 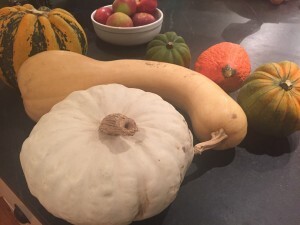 We’ll try to give a synopsis of some of the more common CSA varieties, and hopefully one can get an idea how to work with any squash from there. 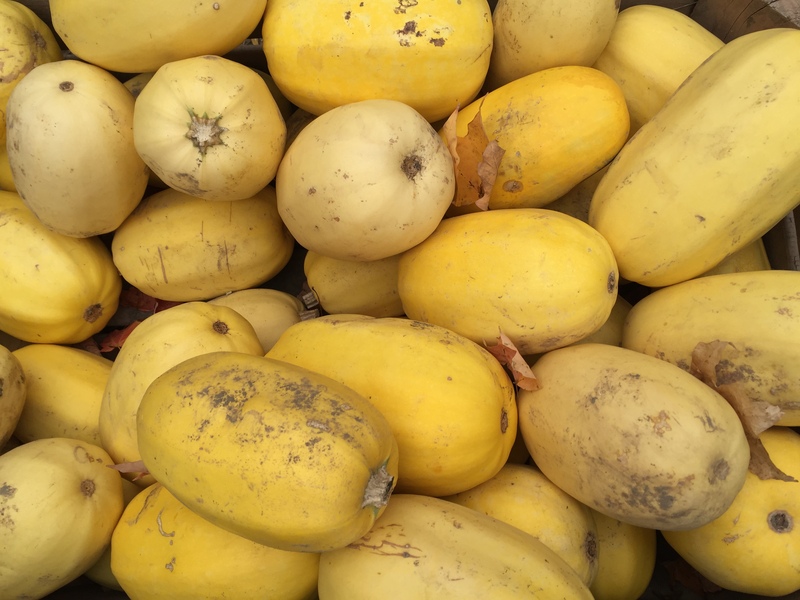 Spaghetti Squash – This one is fabulous as a substitution in many noodle and pasta dishes. Just bake until tender and comb out the de-seeded center with a fork! 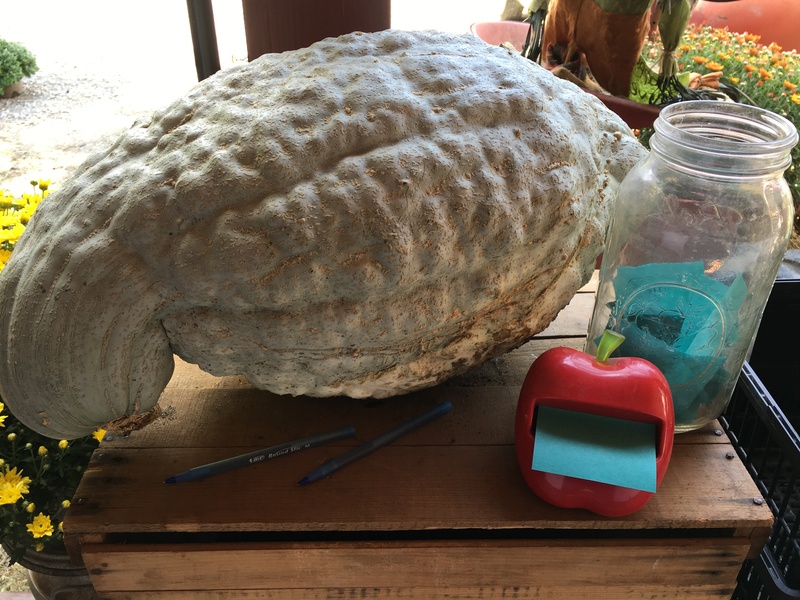 The infamous acorn squash. Named for it’s shape but with an accompanying nuttiness, these will store for up to 2 months (sometimes longer). A good one for quick roasting and pureeing. The puree is subtle enough to sneak into many dishes such as chilis, pasta sauces, and baked goods! Butternut squash, this is the original gangster. If “cured” (the very process of toughening the skin for storage), these sweet beauties will keep for up to 6 months in cold storage. 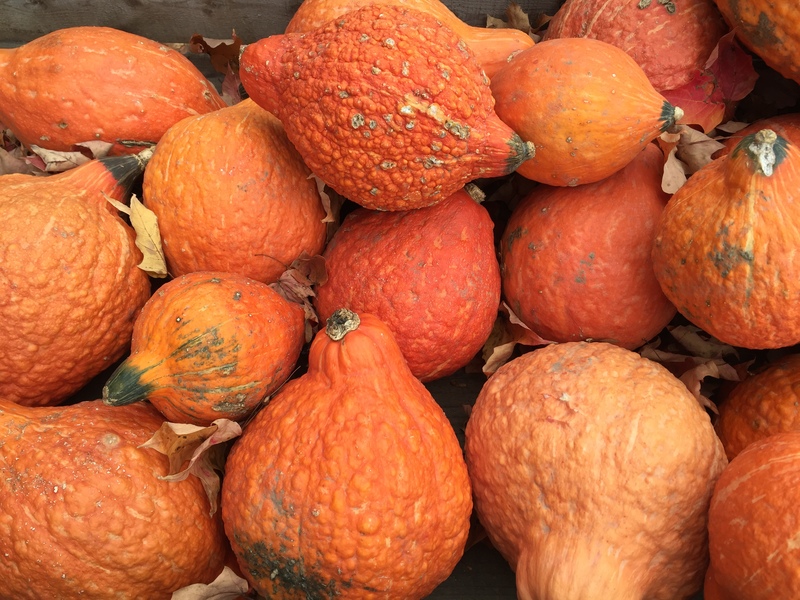 Red Kuri squash. Jess loves these cooked in slices and served as “steaks” on eggs. Red Kuris can be almost indistinguishable from Golden Hubbards, with one major difference. The skin can be consumed on a Red Kuri while the Golden Hubbard’s skin can not. Ask Farmer Jamie if you have trouble distinguishing! 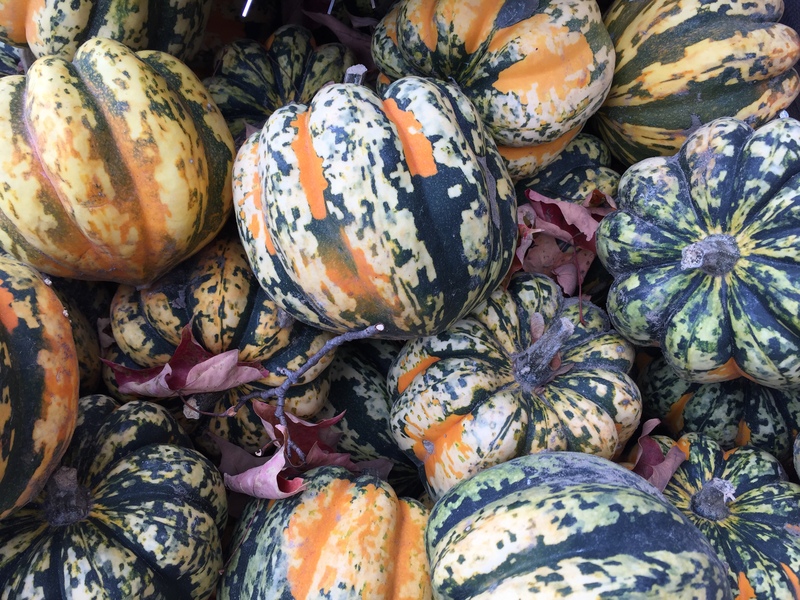 Speckled Hound – this variety looks similar to a Cinderella pumpkin. The cavity is much less hollow, making it a perfect vessel for fondue when roasted. Cameo Squash. Another interesting and tasty variety. 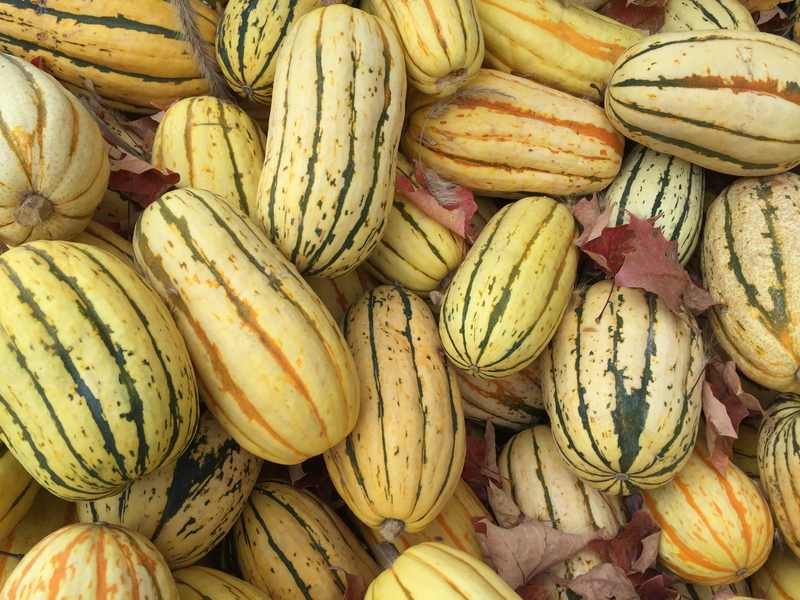 Delicata – delicate in flavor as the name implies. This variety should be eaten first as it does not keep as long as some of the tougher skinned ones. The sweet flavor accompanied with the tender and aesthetically pleasing skin makes it a perfect side dish for that special occasion. Stuff it, bake it whole, or slice it into crescents and roast to bring out that lovely flavor. 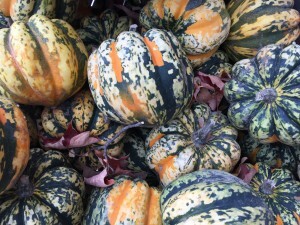 Dumpling Squash- Similar to the Carnival variety. Buttercup. 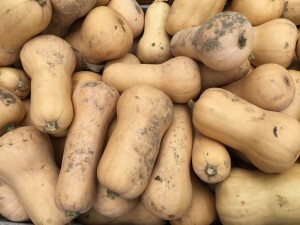 This less well known squash is similar to butternut, with a more nutty and creamy flavor. (Jess likes it more than Butternut, and just one notch back from her favorite variety, Kabocha). Cut around the light green rim to expose the flesh of the buttercup. Cold storage is not nearly as complicated as it sounds, and can take some experimentation to find the best spots to store in your house, temperature-wise (low 50’s) and humidity-wise (60%). My “sweet spots” are in an inner room in our garage, and in the basement near and in the bulkhead. 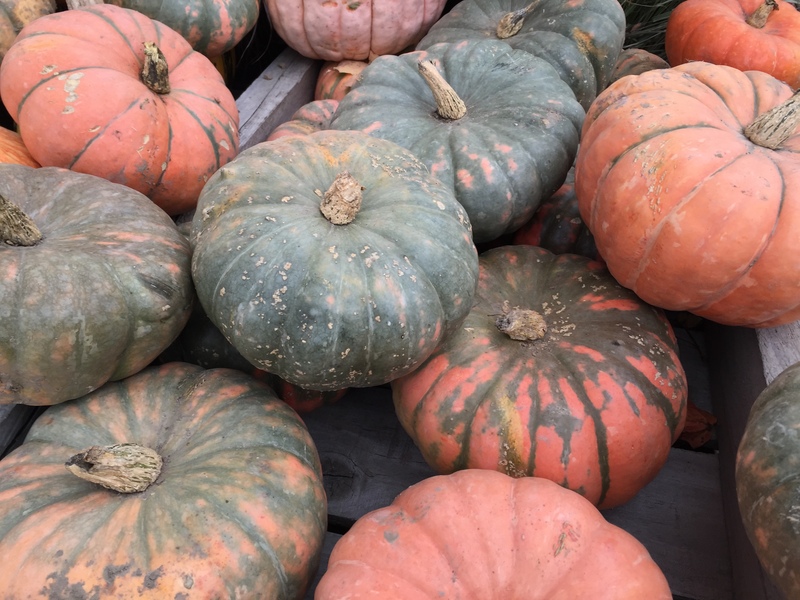 Some squashes do better with “hardening” first, to toughen their skins up a bit for longer storage (butternut, hubbards, and red kuri’s can store for MONTHS after being hardened). The only problem is that hardening takes them being in the heat for a week and it’s gotten cold out, (I hardened many of mine on a table in the sun in October). 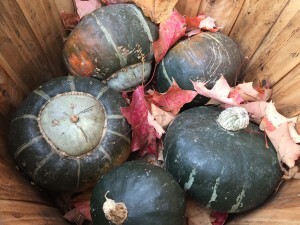 It’s not the end of the world if hardening didn’t happen, some of the squash have been kind of hardened already by being in the farmstand bins. Not all squashes need to be hardened to store, acorn squashes for example generally do not respond well to hardening. Acorns can also tolerate slightly colder temps than the low 50s (sometimes I put them in my bulkhead). Acorns generally keep for up to a month or so but I’ve kept them twice as long and they’ve held up well. If the skin starts turning orange, like, in more than one spot, it’s a signal to use them. If they are ready to use before I am, I’ll roast, puree and freeze them for later use. 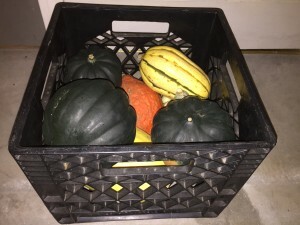 I love these milk crates for squash storage as they allow the squash to “breathe” underneath. Be sure not to take the crates from the farm though! Cold storage usually involves checking the squash every few days, as one blemished squash can take a bunch down with it quickly. Use the blemished ones up right away and keep them away from their buddies. Ideally storing the squash in a single layer is best (off the basement floor), but I keep mine stacked in small crates, since I move them around if the temperature shifts drastically. Bonnie Plants has an informative page on storing winter squash here. This link also provides an excellent one-page synopsis on squash storage. Roasted Cameo Squashes make awesome soup tureens. Here’s one file with butternut squash soup. 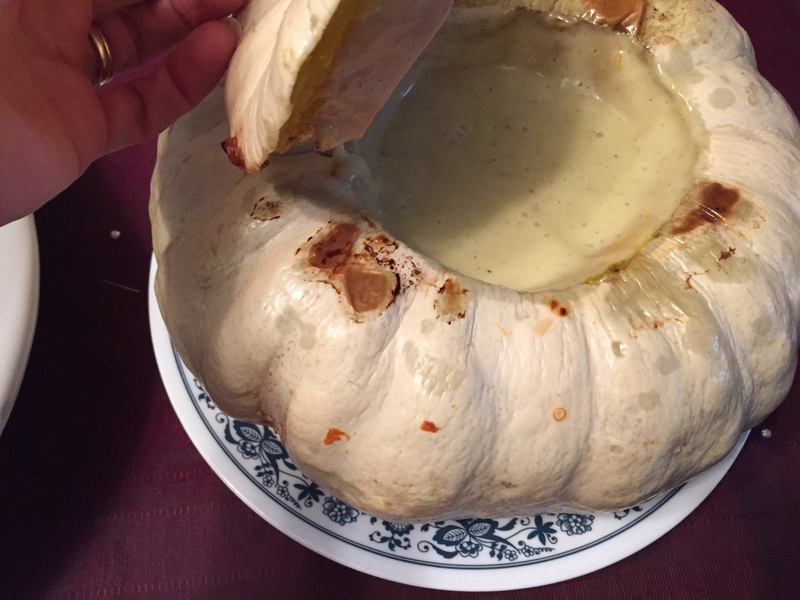 Here’s a mystery squash filled with a potato leek soup. Here’s another filled with Sweet Potato Peanut Stew. We love these! 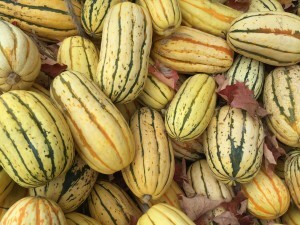 At any rate, winter squash come in countless varieties and we are always surprised with what we find in the share box. You can use the above directory as a guideline, but don’t be afraid to experiment and get creative! These scones are scrumptious! Review the recipe to see which stir-ins you might want to try with these, as they are not on the CSA365 pantry “staples” list and will likely require a trip to the market. (i.e. crystallized ginger, cinnamon chips, coarse sugar etc). You can skip the fancy stir-ins as well, a healthy sprinkle of cinnamon sugar also works. This is a very flexible recipe, wonderful with charred poblanos or jalapeños, add some ground beef for an even heartier version. Tomatillos also work, but can be left out as well. With the base of the squash and the black bean, the rest is pretty negotiable depending on what you have on-hand to work with. Make it your own and enjoy! A quick prep, slow cook, and overall easy method for cooking your winter squash. These were a great stand-in for the traditional dough version, great for sopping up the flavors of a hearty stew or broth. 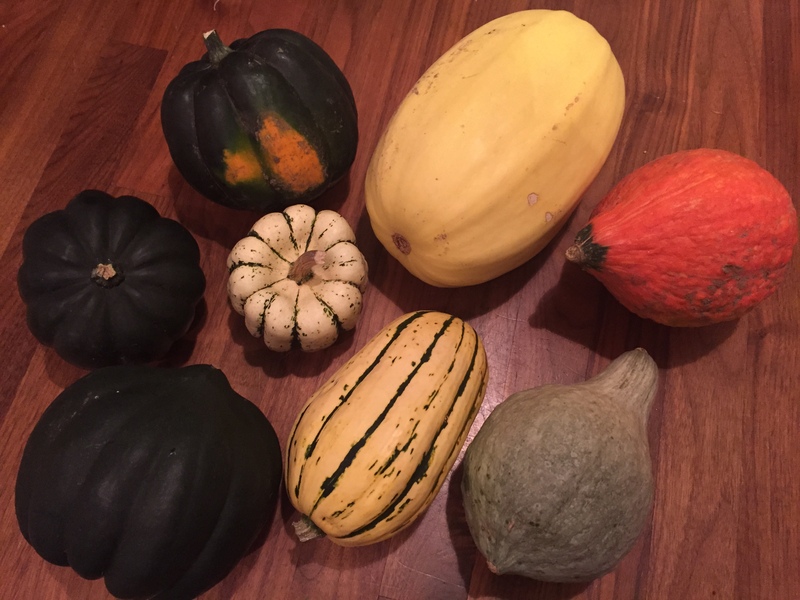 The acorn squash is an impromptu addition that I was quite happy with. You’ll need potato starch on hand for this one to keep it gluten free. This recipe is my favorite way to conquer a whole Hubbard squash. It makes 2 pies (calling for 2 prepared pie crusts) and if there’s extra squash, a side dish. It takes about 2 1/2 hours including squash roasting and pie baking time, but it can be made in stages, so don’t feel like you need to do this whole thing start-to-finish in one wallop. If you have any puree left over, enjoy it with maple syrup and Amish Roll Butter! Do you like Thai curry? How about the warm and comforting flavor of Massaman curry? If so, this dish may be for you! 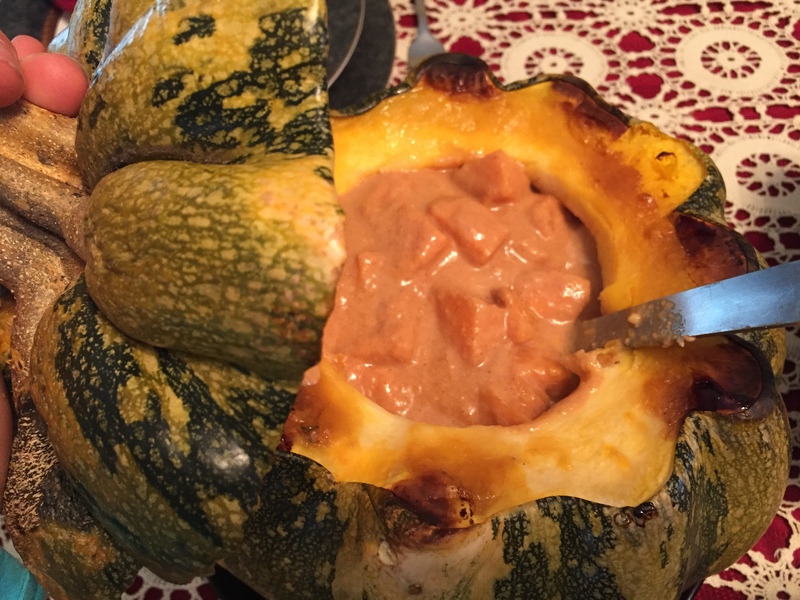 I called it pumpkin curry in the title because that’s how I originally started making it, but as you can see this version has delicata squash. 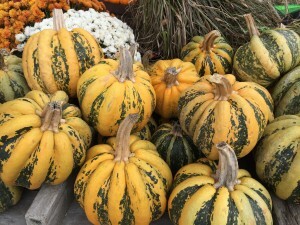 Really, any winter squash will do. Carrots and potatoes are great also if you have them on hand. This recipe lends itself to a slow cooker, instant pot, or stovetop. Make it with chicken or as a vegetarian dish. There are tips in the post to make it your own. I hope you enjoy it as much as I do! This peanutty protein packed soup is creamy and hearty in all the right places, and the sweet red peppers pack a lovely punch. 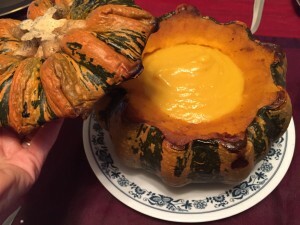 The optional winter squash soup tureen is a nice touch if making this for a special occasion. Butternut squash, acorn squash and cranberries can make a creative receptacle for whatever stuffing you’d like to use in this faux “crown roast”. It’s a bit of prep, but a fun vegetarian option to the holiday roast! Be sure to read the tips at the end of this post before embarking on this culinary adventure! Thanks to fellow Springdellian Pam H for turning us onto this recipe from Cooking Light!